The following is a list of notable deaths in May 2013. Kris Kross was an American hip hop duo formed in the early 1990s that consisted of Chris "Mac Daddy" Kelly and Chris "Daddy Mac" Smith. The duo was discovered by Jermaine Dupri in 1991 and hit worldwide status the following year with their smash hit debut single, "Jump", which topped the Billboard Hot 100 for eight weeks and was certified double platinum as a single. They went on to release three studio albums, with their debut album Totally Krossed Out topping the US Billboard 200, and their following albums, Da Bomb and Young, Rich & Dangerous making it into the Top 20. The duo were also noted for their signature fashion style of wearing their clothes backwards. Chris Kelly died of a drug overdose in 2013. Martin Kevan was a Canadian actor, voice actor, and author. 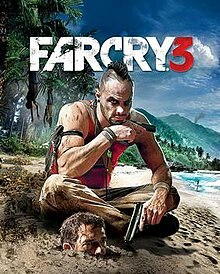 Far Cry 3 is an open world action-adventure first-person shooter video game developed by Ubisoft Montreal and published by Ubisoft for Microsoft Windows, Xbox 360, and PlayStation 3. The game was released on November 29, 2012 in Australia, November 30 in the UK, and December 4 in North America. A stand-alone expansion titled Far Cry 3: Blood Dragon was released on April 30, 2013. A new edition updated for the Xbox One and PS4 was released on June 26, 2018 titled Far Cry 3 Classic Edition. Sir Terence Norman Beckett was a British businessman, who was chairman of Ford and later became director-general of the Confederation of British Industry. Roddy Blackjack was a Canadian elder and former Chief of the Little Salmon/Carmacks First Nation of the Yukon Territory. He also served as an executive elder of the Council of Yukon First Nations and "elder in residence" at Yukon College. Joseph Henry Astroth was an American professional baseball player. He was a catcher for the Philadelphia/Kansas City Athletics. Astroth attended the University of Illinois at Urbana-Champaign, batted and threw right-handed, stood 5 feet 9 inches (1.75 m) tall and weighed 187 pounds (85 kg). Herbert Blau was an American director and theoretician of performance. He was named the Byron W. and Alice L. Lockwood Professor in the Humanities at the University of Washington. Barbara "Bobbie" Lucille Banda was an American Juaneño tribal elder, activist, and a member of the Juaneño Band of Mission Indians. Banda successfully championed efforts to introduction Native American curriculum, including Juaneño language courses, into the public school systems around San Juan Capistrano, California, during the 1970s. The curriculum is still taught in California public schools today. The Juaneño or Acjachemen are an indigenous people of California. They traditionally lived along the coast in what is now Orange and San Diego counties. The name "Juaneño" originates from the Spanish Mission San Juan Capistrano, founded to colonize the area in 1776. They traditionally spoke the Juaneño language, a variety closely related to the Luiseño language of the nearby Luiseño people, but this is extinct. In the 20th century, they organized as the Juaneño Band of Mission Indians, Acjachemen Nation, which is recognized by the state of California, but is not federally recognized. The Governor of Indiana is the chief executive of the state of Indiana. The governor is elected to a four-year term, and responsible for overseeing the day-to-day management of the functions of many agencies of the Indiana state government. The governor also shares power with other statewide executive officers, who manage other state government agencies. The governor works out of the Indiana Statehouse and holds official functions at the Indiana Governor's Residence in the state capital of Indianapolis. Jürg Amann was a Swiss author and dramatist. He has written radio plays, a biography of Robert Walser, and other works. Alan Arnell was an English-born footballer who played as a centre forward in the 1950s and 1960s. He played for Liverpool, Tranmere Rovers and Halifax Town. Balbino Jaramillo, 61, Colombian Olympic cyclist. Antônio da Silva Terezo, 59, Brazilian footballer. Harold Whitfield, 94, South African cricketer. Leonard Harbin, 98, Trinidad cricketer. Dominik Sucheński, 86, Polish Olympic sprinter. Robert Chalmers, 67, South African cricketer. Tamás Homonnay, 87, Hungarian Olympic athlete. Eelco van Asperen, 48, Dutch computer scientist. ↑ "Former state Rep. Millerick remembered as a loyal friend". Archived from the original on 2013-06-15. Retrieved 2013-06-01. ↑ "Musician, bandleader Ollie Mitchell dies". Archived from the original on 2013-06-22. Retrieved 2013-06-01. ↑ Charles M. McGowan, 89, former Mass. state rep.
↑ Dr. Jeffrey A Hunker, Ph.